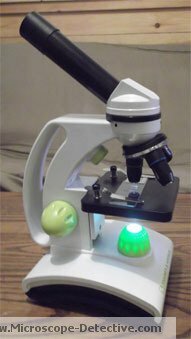 There are many different types of microscopes, from little plastic toys for kids to highly advanced scanning microscopes for scientists. But how many types are there and who uses them? You can categorize microscopes in a number of different ways, but one of the easiest ways is to look at how the microscope produces the image. Some use visible light, while others use a beam of electrons or sound waves. Some produce highly detailed two-dimensional images for research, and others generate a low-magnification three-dimensional image for dissection. Here we've divided the different types of microscopes into three main categories: optical microscopes, electron microscopes, and other. While you probably won't use most of these, it's fascinating to see what's out there! Compound Microscopes - Most people immediately recognize a compound microscope from seeing them in movies or using them in their student days. The original microscope design was a compound optical, and it's still the most commonly used today. A compound microscope works by illuminating the slide from underneath with a light bulb. The specimen is then magnified by a series of lenses, one near the slide (called the objective lens) and one near the top (called the eyepiece). This results in a two-dimensional image that you can adjust depending on the strength of your lenses. Compound microscope parts vary per design, but are usually pretty standard. This makes them easy for anyone to learn and use. Other advantages of compound microscopes are that they can go up to a high magnification and are affordable for amateurs, students, and scientists. A disadvantage is that they have a lower resolution, so your image will never be as crisp and sharp as some more advanced types of microscopes. 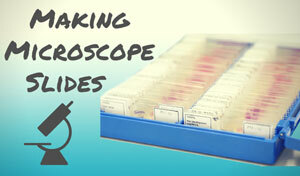 Click here for a more detailed look at compound microscope parts. 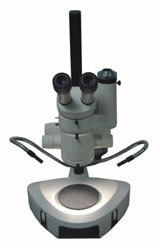 Stereo Microscopes - A stereo microscope differs from a compound microscope in a few key features. The most critical difference you may notice is that it has two eyepieces instead of one. The purpose of the stereo microscope is to produce a three-dimensional image, hence the two eyepieces that send a different image to the right and left eye. The specimen is usually lit from above, rather than underneath. This makes the stereo microscope ideal for dissection, inspection, circuit board work, manufacturing, or use with any opaque specimen. Stereo microscopes are very easy to use and are fairly inexpensive, making them ideal for amateurs, professionals, and people in industries that aren't overtly scientific. They have a low magnification so you cannot see individual cells, which may or may not be an advantage depending on your needs. Their biggest use is the ability to create three-dimensional images. 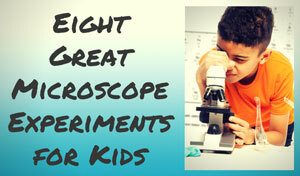 More info about stereo microscopes is here. Confocal Microscopes - Unlike stereo and compound microscopes, the visible light source comes from a laser. The laser scans the sample with the help of a series of scanning mirrors, assembles the image in a computer, and displays the image on a screen. No eyepieces here. Because the laser can penetrate a sample deeper than light from a bulb, you can create a three-dimensional image from a selected depth of the specimen. So you can examine interior structures of a non-opaque specimen, or look at the surface of an opaque specimen as deep as the laser light can penetrate. This results in highly selective, detailed images. As you can imagine, confocal microscopes aren't for the layperson. They cost tens of thousands of dollars or more, and are used by research scientists such as molecular biologists. These days, many optical microscopes send their image to a computer screen rather than an eyepiece. Then they're often referred to as digital microscopes, but the light source and interior parts of the microscope are still the same. These have become much more popular over the years, because it's way easier to look at a large screen than a tiny eyepiece! Scanning Electron Microscope (SEM) - A SEM sends a beam of focused electrons to the sample, which bounce off to create a three-dimensional surface image. With this method, you can create a picture with high magnification and high resolution, but it will always be an exterior view. When using a SEM, the sample must be electrically conductive enough so the electrons actually bounce off it to create the image. Thus specimens are often coated in a thin layer of gold or other metal. Transmission Electron Microscope (TEM) - A TEM works by sending the beam of electrons through a very thin specimen. So rather than scanning over and bouncing off, the electrons pass through the sample to create a highly detailed two-dimensional image. Since the TEM allows for such incredible interior detail, they're often used in medical research and nanotechnology. Electron microscopes are very expensive and technical to use. Thus they're for serious scientists, not students or hobbyists. There are some disadvantages of electron microscopes, but their contribution to research is invaluable. 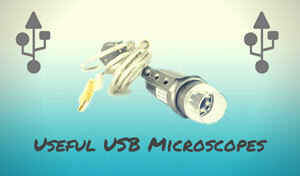 Scanning Probe Microscope - These scan the sample with a physical probe. The tip of the probe raster scans (goes line by line) the specimen and generates an image with a computer. Unlike an electron microscope, these scan in normal air rather than a vacuum (or partial vacuum). But the scanning can be slow and the maximum image size is limited. Scanning Acoustic Microscope - These use a principle similar to sonar, in that they employ sound waves to measure the sample. This type of microscope, called a SAM, is used to find cracks and voids, detect counterfeit materials, test for failure and reliability, and perform quality control on physical materials. They can also provide information on the elasticity of cells for biological research. 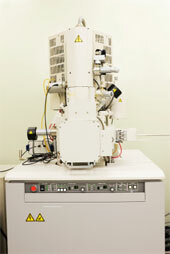 X-ray Microscope - This one uses electromagnetic radiation in the form of x-rays to produce images of tiny objects. Unlike an electron microscope, it can be used to generate an image of living cells. They're useful in biological research and metallurgy, as the images are highly detailed. 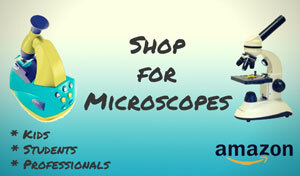 Those are the main types of microscopes, but there are others. Some have fallen out of fashion, and some (such as the neutron microscope), are still in the more experimental stages. 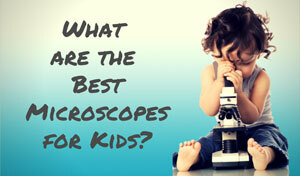 As technology and scientific understanding moves forward, the types of microscopes available will change as well. The average person will only use a compound or stereo microscope, but it's fun to learn about the others. Microscopy has come a long way, and the detailed images an advanced research microscope produces are amazing!